Strip Brushes Strip brushes are long, thin brushes used for a variety of conveyor product cleaning, sealing and surfacing applications in industrial, commercial and some consumer product contexts. Strip brushes are widely used throughout many industries. They can be coiled to form cylindrical coil brushes, outside disks, inverted disks and cup brushes. 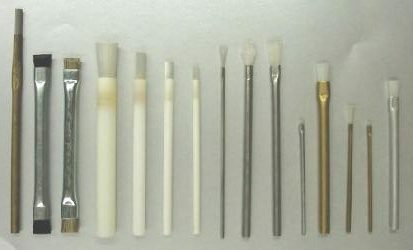 Other types of strip brushes can be designed to seal doors, windows, conveyor edges, cleanroom doors and other cracks and openings that require a flexible seal. A strip brush's properties and configuration determine how it will be applied. Strip Brushes – Spiral Brushes, Inc. Fill material, bristle length, channel size and length all affect a strip brush's performance. 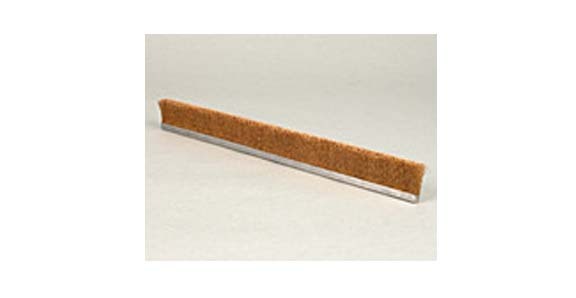 Straight strip brushes are often used on conveyor belts for sweep cleaning, product guiding and sorting as well as in sealing and guarding applications, such as vehicle spray guards. Coiled strip brushes, disks and cup brushes are also used frequently in conveyorized processing for cleaning, surface roughening, dusting, sorting, washing food products, lint brushing, static dissipation, pipe cleaning, textile felting and surface finishing. Metal-bristled coil and cup brushes are often used at high speeds for deburring, finishing or polishing. Strip brushes wound into tight coils are called cylinder brushes, a common cleaning and surface finishing tool. Nylon is one of the most common fill materials used in strip brushes, since nylon offers superior abrasion resistance, bend recovery and flex fatigue recovery. Sealing strip brushes and many coiled cylinder brushes are made from various lengths of black nylon. Other strip brushes can be made of polypropylene, polyester and abrasive polymers embedded with silicone carbide particles. 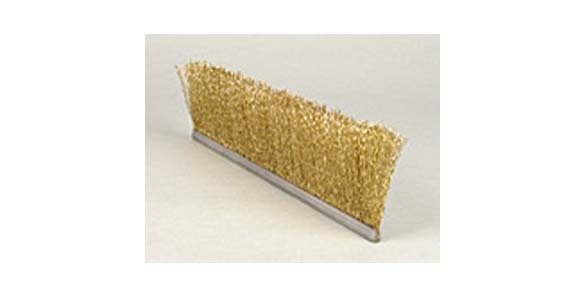 Metal is sometimes used as a strip brush bristle material in applications in which an abrasive brush is needed, and animal hair is sometimes chosen as a bristle material for strip brushes used for polishing and cleaning, but the use of animal hair bristles is low compared to other materials because of its expense. Strip brushes are among the most versatile industrial brush varieties because of the wide range of shapes they can take. A strip brush can be as simple as a straight strip used to seal the gap between a door and its frame, or it can be mounted to a tube along with several other strip brushes to form a power brush attachment. They can be twisted around to form spiral brushes, and they can bent into a circle and attached to form a circular brush.